like that. He always starts by telling them who they are in Christ first. “Paul, called to be an apostle of Christ Jesus by the will of God, and our brother Sosthenes, To the church of God in Corinth, to those sanctified in Christ Jesus and called to be his holy people, together with all those everywhere who call on the name of our Lord Jesus Christ—their Lord and ours… I always thank God for you because of his grace given you in Christ Jesus” - (1 Corinthians 1:1-2, 4). This is the pattern throughout the New Testament and it’s a powerful pattern that sets us free to live as God created us to live. First we realize the truth about who we are in Christ, then comes the “expression” part. "Marching” focuses on the commands without even thinking about who we are in Christ. “Dancing” begins when we rest in what He has done, and who we are because of it. Listen, when someone realizes that they really are an A+ student because of Christ, then they will start to live like it. That’s totally backwards from the way it works in the world… but then again, isn’t almost everything Christ did?! My Heavenly Father, I am a mess too, just like the Corinthians. I thank You from the bottom of my heart for the grace You have given me in Christ Jesus, that I’ve been set apart. I thank You that I am called to be holy, chosen by You to be Your child. Amen. Feeling burned out? Unfulfilled? Drained? If so, you’re in good company. 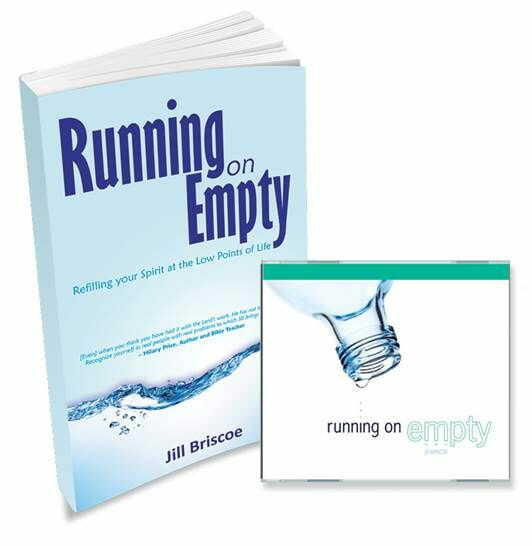 Jill Briscoe shows you, with her insightful and truth-filled book and CD series called Running on Empty, how Jesus offers comfort and hope. Through her usual wit and candor, Jill provides spiritual refreshment and renewal when you’re ready to break down or throw in the towel! The Running on Empty book is our gift to thank you for your ongoing support to help Telling the Truth continue encouraging you and others to experience true Life in Christ. Both the Running on Empty book and 6-message CD series are our gifts to thank you for your special donation this month of $50 or more. Thank you for your generosity and partnership!